January 15, 2015. This date marks five years since my father passed away. Even now, I think of my father everyday and the moments we shared together. Each year, November through January are difficult months as we celebrate the holidays without father. At times, I think that some of my sadness comes from not knowing the details of who my father was. There are many questions I wish I could ask: How were you like as a child? Who was your best friend? What was your favorite subject in school? What are the things that made you happiest as a young person? What are the things that made you sad? For a few years, I was unaware of the conflicted and complex feelings I had surrounding my father’s death. Through writing about my experiences, I uncovered my true feelings and was surprised to find the anger I held towards my father. He died a few minutes before I arrived at the ER, and I wasn't able to say goodbye. I had always imagined that I would be with him in his last moment, and I buried my disappointment because I didn’t want to taint the good memories. Another discovery I made was the expectation I held for our relationship. For most of my life, I looked to my father whenever I needed any kind of support. He was the person who always made things better. Undergoing a series of strokes and developing vascular dementia, my father suffered tremendous loss to both his physical and mental abilities. For awhile, I was delusional and believed that father would recover from his illnesses because he was a "rock." Instead, my father became depressed and cried about feeling useless and confused. After he died, I realized that his suffering was not just about the obvious losses, but rather, what the losses had meant to him. My father lost the roles that defined who he was. With weakening health, he was no longer the man, the husband, and the father he had been. This experience must have been intolerably painful for my father, yet I failed to grasp the depth of his struggles when he was alive. 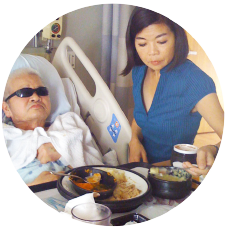 In being a caregiver for my father, I was able to grow beyond my narrow, self-centered concerns. The experience sparked my interest to study gerontology. Now with my degree, my goals are to contribute to a greater understanding of aging, to help create solutions to meet the needs of an aging population, and to support an intergenerational society that includes the visible presence and the voices of our elders. In midlife, I finally found my life's purpose. For this, I am forever grateful to my father. Thank you for reading my post.